My husband, Franklin, and I, Lorena, are in the photo. We dressed up using Tim Burton's "Corpse Bride" as an inspiration. I used an old white dress with a t shirt material. I went to Michael's craft store and bought 3 packs of 'tutu' material, blue ribbon,blue, white, black face/body paint, blue and gray flowers. I put on my old white dress and started to hot glue tutu mesh from the hip down to mimic a wedding dress look. Then i took the blue ribbon and put it around my waist using hot glue to glue it in place and used the same blue ribbon to put around the top of my old dress all in hopes of mimicking a wedding dress. I then took makeup and put it on my palms and wiped it on the dress everywhere to give a look of "dirt"..like I had crawled out of a grave. 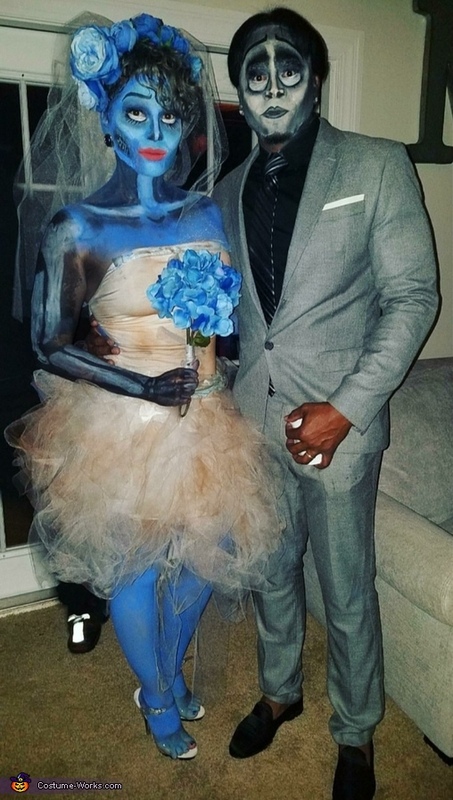 I did the same with some black face paint...very light to make it vague on the dress. I then took the blue paint and put it all over where my skin was visible. Except for my right arm..i did it in black to leave it for later giving it the illusion of missing skin. I painted with white paint arm bones over the black once it was dry. I used white paint under my eyes to make my eyes bigger and contoured my face to give it a sunken in look. Before painting my face I used stick glue to glue my eyebrows down to leave a smooth surface to paint over them and draw "new" eyebrows higher up so I could make my eyes appear larger. My hair was dyed gray. I used an old headband to glue the flowers on and some more of the tutu mesh material to make a veil. I contoured my collar bones to make them look more sunken in as well. I took cotton and elders liquid glue and stuck it to my face in am oval to make a 'hole in my face. Once dried I painted inside the hole black and used dark blue makeup and black eyeshadow to shadow around it to give it some depth. As well as white paint to make teeth. For my husband's costume...he put on a suit as if in a wedding. I straightened his hair out and flat ironed it to part down the middle. I used white and black to make his skin gray. I contoured his face to make his face appear thinner and dreary. I used stick glue to get his eyebrows down and painted black circle around his eyes and made his eyebrows higher and his eyes appear larger as in the movie. We painted gray over his mouth and used a black eyeliner to remake thinner lips like the movie. I used the flowers left over for a "bouquet " and my old body building competition shoes for my wedding heels. All in all I spent $64 for everything. It was inexpensive and awesome to wear to our Halloween party for the evening.